What happens when there’s a part of your past, or a part of who you are, that you’d just rather forget? And what happens when that very past catches up with you and makes you question everything you think you know about yourself? Riggs Crossing, the debut novel by Michelle Renee Heeter, excels as a story of loss, belonging, memory and upbringing. When Len, a fourteen-year-old girl, is found in a car wreck near Wollombi in NSW, surrounded by spent bullet casings, bloody clothing, she quickly learns what it means to lose something. She wakes up in a hospital with severe injuries and psychological trauma so deep, she has completely erased any memory of what happened to her in the accident. She doesn’t even know her real name and is given the nickname ‘Len’ by the nurses, based on the name embroidered on the jumper she was wearing when she was found. She is taken to a children’s refuge in Sydney where she encounters a supporting cast of intriguing characters that challenge, confront and annoy her, which leads Len to display signs of aggression, reclusive behaviours, racism and defiance toward her peers and the social worker, Lyyssa. Her battle does not stop with the people in the refuge, as time passes patches of memories start to resurface and Len starts to piece together the puzzle of who she really is and what really happened to her. She remembers her father as a marijuana cropper in Riggs Crossing and the shady characters that surrounded their life. Soon, she is closer to the truth than ever before, but the truth catches up with her before she has a chance to fully uncover it. The men responsible for the car accident and the shooting of her father find her in Sydney and try to put an end to Len and her story, once and for all. In the events that follow, Len’s story unfolds before her and she discovers that her real name is Samantha Patterson, whose mother and father were both tragically murdered. As she comes to terms with her loss of family, belonging and identity, Samantha starts to work toward a path of recovery and healing, as she learns to find her place in the world that abandoned her. 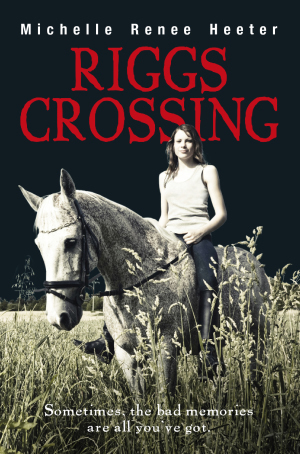 Riggs Crossing is a poignant tale, written with a strong and identifiable voice, which raises important issues about morality, racism, choices and upbringing and is a significant read for those wanting to explore the underbelly of human existence.